I am lucky to have been profoundly influenced by two grandfathers, both of whom I affectionately call ‘Ded’ (sort of like Pop in Russian). One used to live far from me and come visit occasionally. The other used to live very close to me and took me to museums, to parks and just to eat ice cream. But when I was seven years old, that changed. My family left Russia and both of my grandfathers (and grandmother) stayed behind –one in St.Petersburg and the other in Moscow. At the time, I didn’t understand the scope and significance of the move. Years later, when my family moved again – to a suburb in New Jersey, my dad’s dad came to live with us. My mom’s dad, Ded Yulya, (the one who lived near me) would visit, with my grandmother, whenever he could. Ded Yulya is a large man–not heavy, but tall and broad, tanned and gregarious. In his youth, he had a George Clooney-esque-ness about him. His black hair grayed gracefully over the years and despite his age, he continues to work as a civil engineer. Ded is more traveled that anyone I know. He has been to India and the far reaches of the Middle East. He has been to China and Cuba and Portugal and a hundred places whose names I have a hard time following. Ded is a storyteller, and he has many stories to tell. Ded Yulya loves life. He loves a good celebration. He likes to treat people to a good time. He has lifelong friends. And he loves to say, “OPA!” It means a slew of different things in different languages (in Russian, kind of like ‘oops’ and in Greek ‘hooray!’). Ded uses these meanings interchangeably. When I first saw California Opah at a local market, all I could think about was my grandpa. I wonder if he has ever eaten opah –probably. In any case, I had recently bookmarked a recipe in David Tanis’ new book for a halibut crudo and had been dying to try it when I saw a little sign next to the opah: “great for crudo!” I was sold. We purchased more fish than needed for crudo (an Italian-style sashimi) and decided to sear half of it as well. The fish (make sure it is sushi-grade, if you’re going to eat it raw) was an incredible find. Raw, thinly sliced and drizzled with a lemony olive oil, it was delicate, refreshing and melted in my mouth. Seared, it took on a whole different flavor profile: meaty, but still tender, it reminded me a bit of a cross between halibut and branzino. I served it with a light little salad of butter lettuce and blood orange slices. 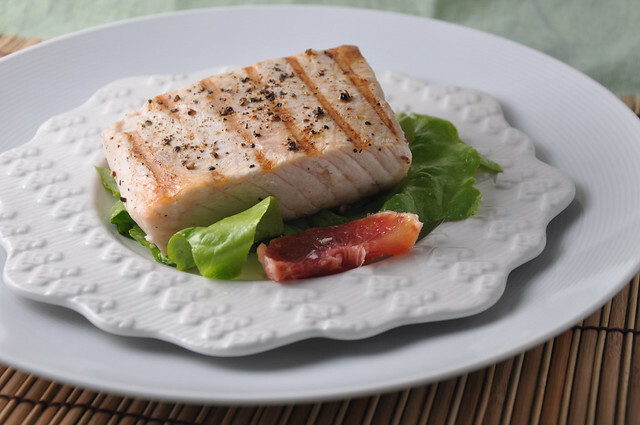 You can make this with sushi-grade halibut, too, but I was particularly thrilled with the opah. Note: the recipe makes extra dressing. If you want to serve four people, no need to double the amount of ingredients for the lemon oil. 1. Place your serving platter in the refrigerator while prepping the ingredients. Arrange the fish on the plate. 2. In a small bowl, whisk together the olive oil, lemon juice, lemon zest, scallions, salt and pepper. 3. Drizzle the sauce over the fish and serve immediately. 1. Season the fish with salt and pepper and brush it with a little bit of olive oil. Set aside. 2. Preheat a grillpan over medium-high heat and lightly grease it with olive oil. 3. Sear the opah on both sides (a few minutes per side), until it develops grill marks and is 3/4 cooked. 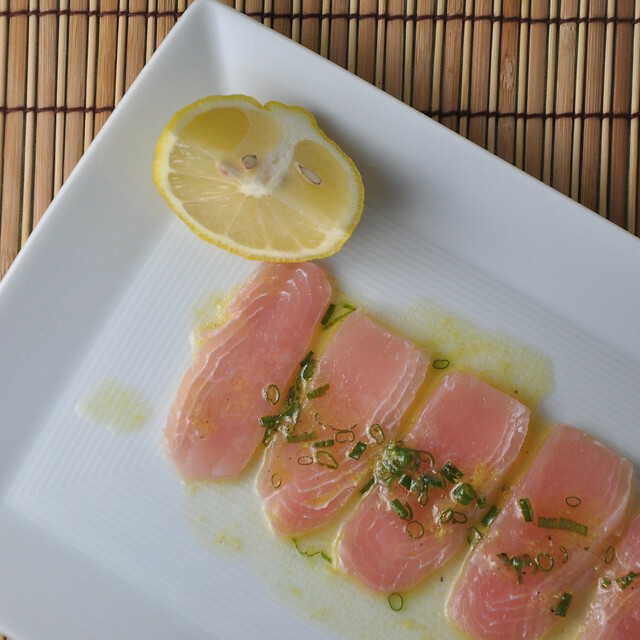 Since your fish is sushi-grade, don’t worry about the very center being slightly raw –be sure not to overcook the fish. 4. 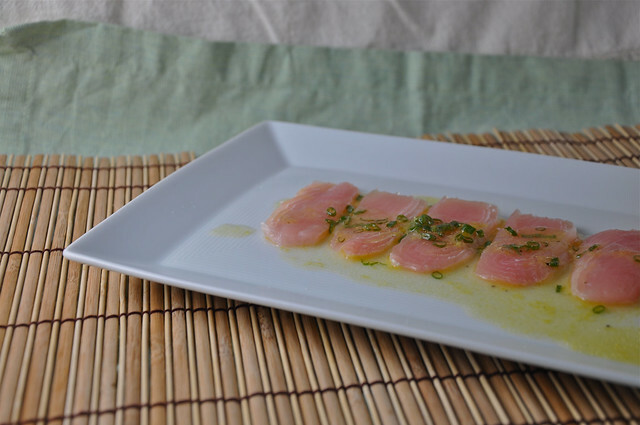 Squeeze a bit of fresh lemon juice over it and serve on a bed of salad, with the crudo as an appetizer. To read about today’s Musical Pairing (and listen/download), head to the Turntable!